Being busy makes you hungry. Well, it makes me hungry. And this was such a busy day so far. We went to get my new glasses, drove all the way to North Kingston, RI, to pick up a donut cake and by 3 p.m. my tummy was growling. Where to go? What to eat? What to do? I know. Laura knew. We wanted pizza, but not just any pizza. We wanted bar pies from Cape Cod Cafe. When I first tasted these wonderful, sized-just-right pies, they went right to the top of my favorites list. So on a very hot Tuesday afternoon we pulled into their Raynham parking lot. The little store-front shop doesn't look like much from the outside but it goes further back than you think. You walk into a very clean, bright, cheery take-out place with several tables for dining in. There's a large wall TV to watch while you're waiting, coolers to get a drink from and very clean restrooms. Laura knew what we both wanted and went to the counter to give in our order along with our sodas. 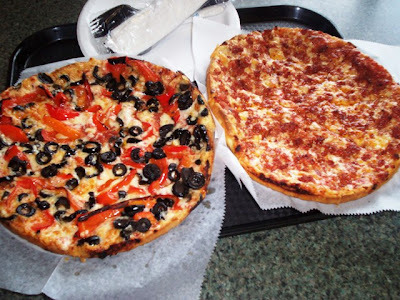 I wanted a linguica pizza (spicy Portuguese sausage) and Laura wanted a pizza with roasted red peppers and black olives (the pies start at $7.15). Then she joined me at our table to wait for our name to be called. Look at these little things of beauty! Laura’s is on the left and mine is on the right. When our name was called, Laura retrieved them right away. Our pizzas were accompanied by paper plates, a packet of plastic utensils and small packs of salt and pepper. On the table were napkins and red pepper flakes. We also had our drinks. With everything on board, we dug in. Now let me tell you why I love this pizza. It's all made to order, which is why there's a wait before you get it. However, it's worth it. The crust is well done and buttery, the pizza sauce is light and fresh, the cheese is top-quality and your meat and veggie toppings are just prepared. This is not fast-food but food well-done and well-worth the wait. It's just so gosh-darn delicious. Because the crust is thin (but not cracker-thin) and flat, the toppings can be spread right to the edges so there's flavor in every bite. You're not left with "pizza sticks”, you know, a huge pile of thick, bready crust that gets left on your plate. Unless you like the pizza sticks. Not that there's anything wrong with that ... I guess. But I say if you like your toppings all squished in the middle with a wide area of naked crust around them (like some pizzas we know), then you got the wrong pie. 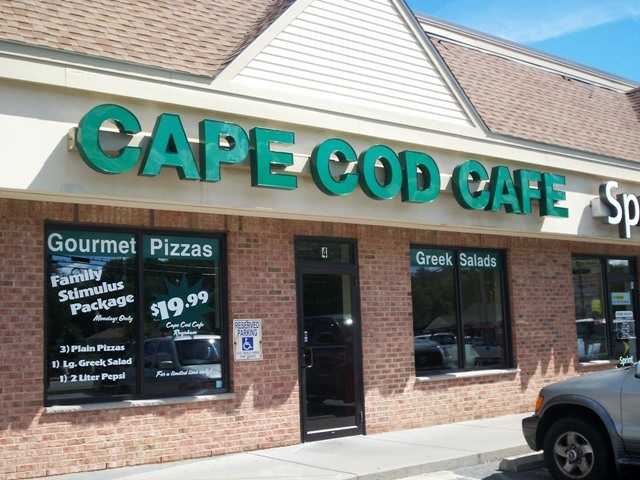 Cape Cod Cafe pies are pies of perfect symmetry, perfect balance of toppings to crust, perfect ratio of sauce to cheese, perfect ... you get the picture. I love these pies. You will too if you give them a try. On this day we went to the shop in Raynham but there are locations also in Brockton and Bridgewater. Click onto their link for their full menu, hours and directions. 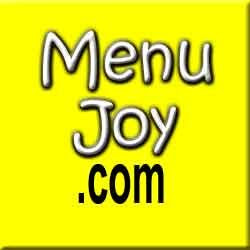 Don't forget to visit MenuJoy.com for great area restaurant menus.